Back in 2008 & 2009 there were headlines, numbers, and analysis being thrown at FDR’s New Deal almost daily. Obama Gives Us the Same Old New Deal. And, How Government Prolonged the Depression. Or, Stimulus: Can it work like Roosevelt’s New Deal? And Roosevelt’s ‘New Deal’ Resurfaces in US Economic Stimulus Debate. But all of these discussions seem to overlook the actual living and breathing people who were impacted by FDR’s New Deal and the very real ways these programs affected and changed their lives. Ways that are not easily translated into numbers for others to analyzed. Eighty years ago, the daily life of the average citizen was very different then our lives are today. And yet many of the financial and economic challenges they faced then seem eerily familiar. Does that mean we are headed for a Great Depression? Or that we need another New Deal? I don’t know. I am not an economist and I don’t want to play one on this blog. But I would like to present some additional numbers and words for everyone to consider in the discussion of what worked and didn’t work. Most historians mark the start of The Great Depression as, Black Tuesday, October 29,1929. Franklin D. Roosevelt was inaugurated March 4,1933. From 1929 to 1933, the unemployment rate went from 4% to 25%. In addition, in 1933, the underemployment (lower wages and hours) rate was 25%. 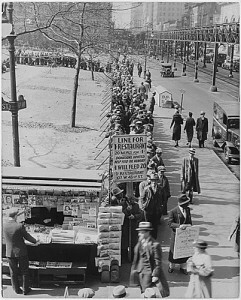 Which meant, nearly 50% of U.S. households in 1933 were directly experiencing unemployment or underemployment. So what did it all mean to the American people who lived with those numbers everyday? What did average Americans think about the New Deal, The Great Depression, and FDR back when it really mattered whether FDR’s New Deal worked or not? Our Holy Books say: A poor man is like a dead man. You came and resurrected the poor man from the dead. You came and said: ‘Wake up, forgotten man. I will give you new life. I will give you a new deal.’ Like the prophet, Nathan, who said to King David: You have so many sheep and yet you want to take the last sheep of the poor man; so you said to the rich, to the Wall St. bankers: Leave the poor man his last sheep. Let him also live. All the rich men hate you for that. They know that you brought new hope to the poor plain man. They know that never again will the old times come back. May I end respectfully that your name, our illustrious President, will live forever. One thing I will say, – to you! When the city hasn’t got funds to finance Public Welfare, – and they start in squawking to the state, – and then when the state finds the burden’s more than they can swing, – you’ll see how long it takes the old birds in Washington to realize it’s government help, or else – it’s only that it’s too bad to make all the guys go through what they’ve got to, first, in order to convince Congress we’re not just throwing a lot of heffer-dust about ourselves, right? I bought a home in Decatur. That was in 1920 and houses were at their highest price then. The place cost about $8,500 counting the improvements I put in. My wife was rather anxious to own a place. Personally, I never could see that it was cheeper to buy than to rent. . . I also bought a five-acre lot . . . I had over four hundred hens part of the time but that many hens can easily eat fifty or sixty dollars’ worth of feed in a month, and frequently make a return of fifteen or twenty dollars worth of eggs….there was no money to be made on worn-out farm … The farm was profitable only in one respect – it was a pleasant place to live. I sold it in 1937 and netted $500 on it. I may say that I received $500 on my house which had cost at least $6,000 above rent … came back to Atlanta to try for a job, but didn’t have the luck of finding one. … A concentration of wealth in the hands of a small proportion of our citizens cannot possibly be made consistent with general prosperity. Regardless of whether one believes that enormous fortunes are acquired by moral individuals or not… In the United States I believe that our past prosperity has been due to our more fair distribution of wealth among those who produced it rather than to the efforts of a few who have managed to control large enterprises. The New Deal policies seem to me to be generally correct … However, I do not think we are going to see the 1929 levels reached rapidly. Too many people are now accustomed to live on a lower consuming level than they did in the 1920’s. Very few of these I know who are earning well during that period are now spending as freely as they did then. To reach that glorious but rather silly level of spending, we must probably wait until a new generation of spenders, arrives. Would Another New Deal Help? And here’s my hope – as everyone continues to debate our current economic situation, the whys and hows of the New Deal, and what any of this could mean for us now, that we not forget that there are very real and complex American lives at the center of all of this, and they are not easily reduced to numbers and simple formulas. Savvy Bankers? Free-Markets? Populist President?